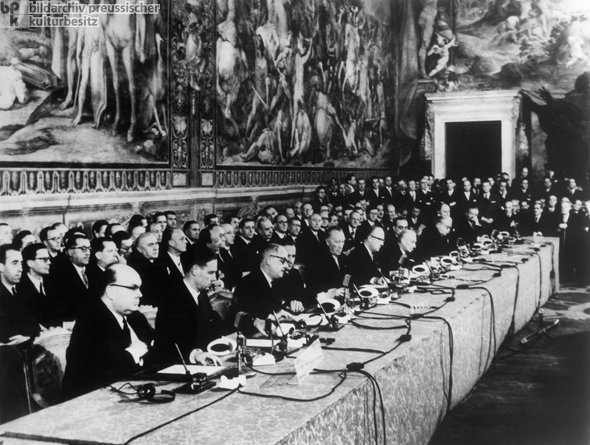 At a meeting in Rome on March 25, 1957, the government leaders of the Federal Republic of Germany, the Benelux countries, France, and Italy signed a treaty on founding a European Economic Community (EEC) and a European Atomic Energy Commission (EURATOM). The EEC member states were striving for a common European market for all products and services, a kind of union that went above and beyond the European Coal and Steel Community founded in April 1951. Over the long term, all internal tariffs were to be abolished within the EEC. In addition to the economic significance of advances in Western European integration, there was also an important political dimension that should be stressed. Here, the collaboration between France and Germany was particularly crucial. EURATOM aimed to create an internal market for nuclear energy and to advance through joint efforts cost-intensive research into the peaceful use of nuclear energy . From left to right: Paul-Henri Spaak and Jean-Charles Snoy (Belgium), Christian Pineau and Maurice Faure (France), Konrad Adenauer und Walter Hallstein (Federal Republic of Germany), Antonio Segni and Gaetano Martino (Italy), Joseph Bech (Luxembourg), Joseph Luns and Johannes L. Homan (Netherlands).